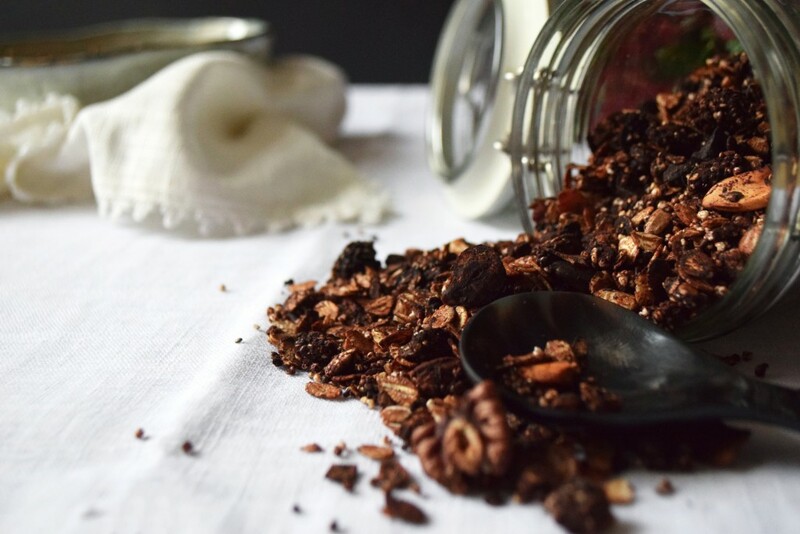 It’s not my first homemade granola recipe, however it’s still my first attempt to make a chocolate granola, natural and low in sugar – don’t run away now, this is not a diet recipe -. Even though Berlin hasn’t succeeded yet to turn me into a hippie, I still try to make more and more efforts to eat organic, to avoid raffined and transformed products, and to use way more natural products, from raw chocolate to cosmetics – well, I can imagine that earning a salary now helps as well for that kind of consumption habits -. 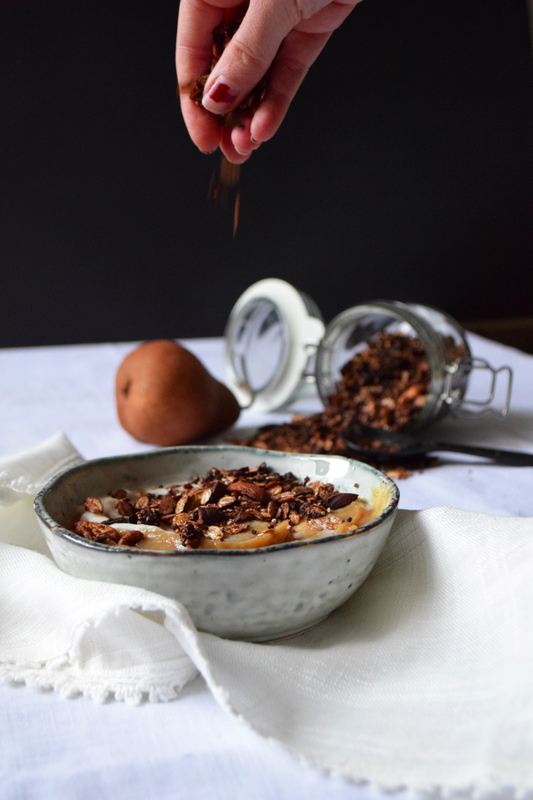 Granola in shops are often fat, full of sugar, expensive and far to be as tasty as a homemade one, that’s why I much prefer the second option. After my 36000 desperate attempts to stop eating too much sugar, – or gobbling non-stop chocolate bars until having tachycardia – I recently bought the Sarah Wilson’s book called “I quit sugar”, where she gives useful advices to get out of this addiction in 8 weeks – I will probably talk again about this book in a following post -. In case of craving, she also advises to replace sugars by good fats as nuts for instance. So what a chocolate granola recipe is doing here, when we know that it’s supposed to be very yummy and rich? The raw chocolate is totally natural and devoid of sugar, while being rich in good fats as well as magnesium and . Its very strong flavor mixed with coconut oil enables to obtain a delicious raw chocolate granola, low in sugar, which is a real ally when you try for instance to get detoxified of it. The abundance of different crunchy nuts in the recipe enables to be satisfied much more quickly, while enjoying their benefits. The recipe contains still 40g of maple syrup, but excuse n°1: I didn’t start the program when I baked it – only a psychological preparation to accept the fact that I must say goodbye to Kinder chocolate bars for the next weeks…-, excuse n°2: foods that contain less than 4g of sugar/100g are still authorized – seriously man, I’m happy for that!-. 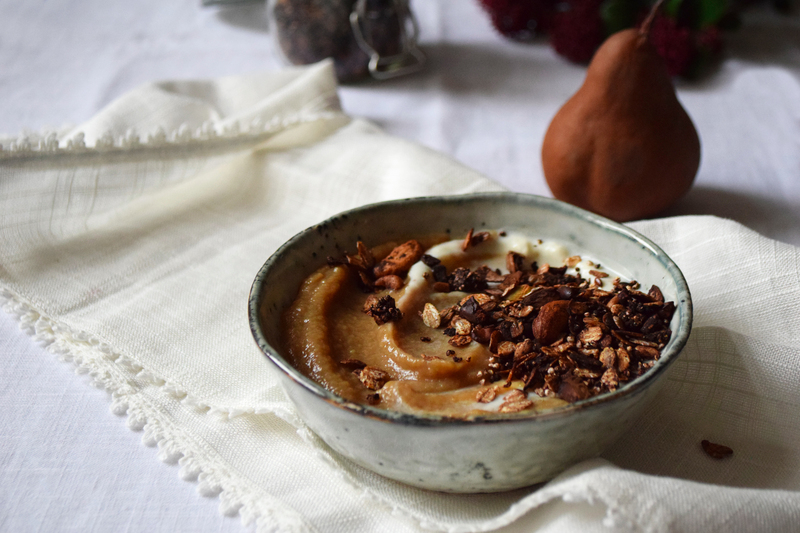 300g oats • 90g coconut oil • 80g raw cocoa in powder • 50g puffed amaranth • 40g maple syrup • 30g hazelnuts • 30g pistachios • 30g pecan nuts • 30g cashew nuts • 30g chia seeds • 30g coconuts flakes • 30g raw cacao nibs • 30g mixed seeds (flax, sunflower, squash,…) • 1tsp bourbon vanilla • a pinch of salt. 1. 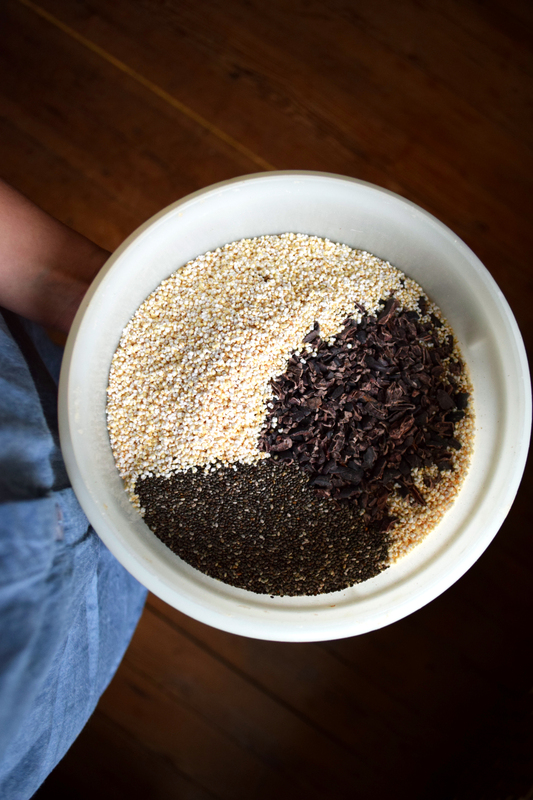 In a big bowl, stir the oats, puffed amaranth, coconut flakes, raw cacao nibs, chia and mixed seeds all together. 2. Crush the crunchy nuts and add them to the mix, stir well again. Preheat the oven at 175C. 3. In a pan, let melt the coconut oil and incorpore the raw cocoa powder with the maple syrup. Stir well with a whisk, until you get a perfectly homogeneous sauce. Pour on the dry bowl and mix the whole, while trying to coat well the ingredients in the sauce. 4. 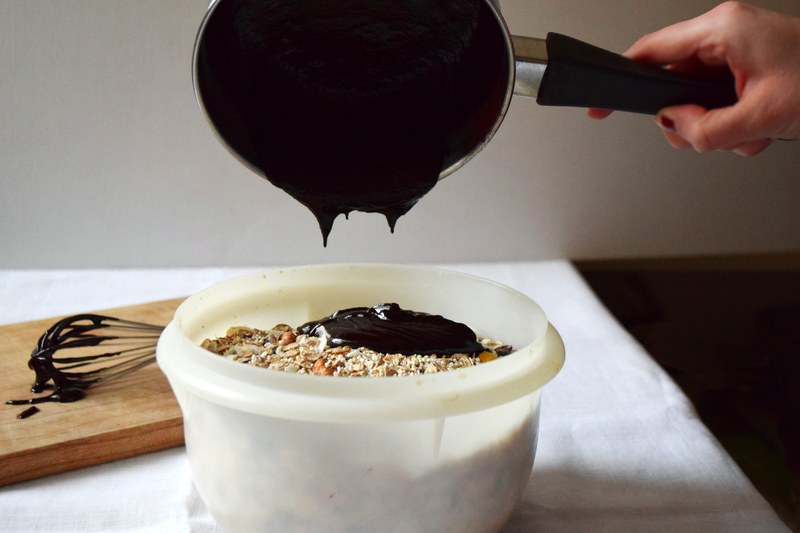 Pour regularly the mix on a baking tray covered with some baking paper, and press well the granola with the back of a spoon (the thickness of the mix might be about 1.5cm). 5. Let bake approximately 15-20 minutes while keeping an eye on it (the granola can burn quickly because of the coconut oil). 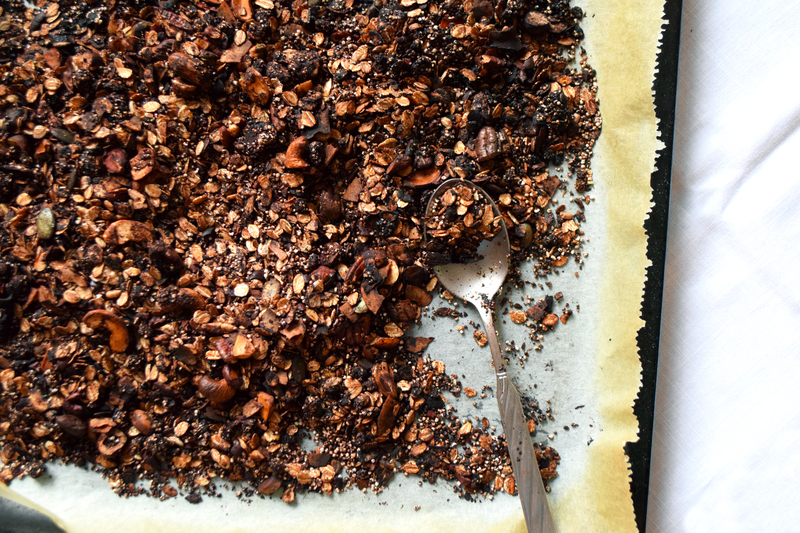 Break the granola in chunks and put again in the oven for 10 minutes, while stiring regularly. You must take off the granola once it starts to get too dark. Let get cold and stock it in some watertight pots. Im SWOONING over this incredible chocolatey dessert-like granola! It would be the perfect topping for anything from ice cream to oatmeal! Thanks Bethany :) OOOH yeah I always use it as yummy topping for yogurts and compotes!